Agricultural workers all over the world rely on ATVs to complete tasks on the farm. However, despite the usefulness of ATVs, serious injuries can result from improper use. If you take proper safety precautions, you can reduce the risk of ATV-related injury or death. 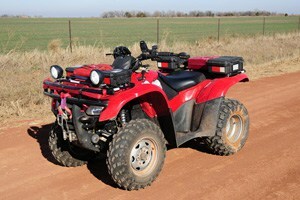 Are all farm workers trained and certified in how to use and handle an ATV? Is there available approved protective gear for all farm workers to wear when operating an ATV? Do all of the lights come on when you start the ATV? Is less than one-third of the ATV’s weight on the rear carrying rack? Have you completed a pre-ride inspection (oil levels, gas tank, air levels in tire, etc)? Are all of the important parts of the vehicle tightened (footpegs, footplates, wheels, wheel bolts, etc)? Are all lines and cables intact? Are there any signs of wear or damage? Does ATV have a Crush Protection Device (CPD) designed to prevent crush injuries in lower speed crashes (<30 mph)? Are children between the age of 12 and 16 only driving smaller ATVs with a 90cc motor under adult supervision? Can the child reach and operate all controls while comfortably seated? Disclaimer: The facts and information listed above are suggestions for your safety, but are in no way a comprehensive and exhaustive list of all actions needed to insure your safety and are not an endorsement of any products mentioned. National ATV Safety Week is the first week of June each year. The ATV Safety Institute, along with many state and local agencies, offer ATV safety courses in conjunction with ATV Safety Week.